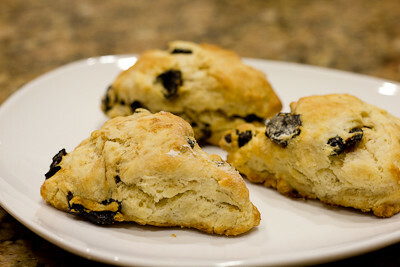 This week's Tuesdays with Dorie (TWD) recipe was chosen by Lynne of Cafe LynnyLu: Cream Scones. 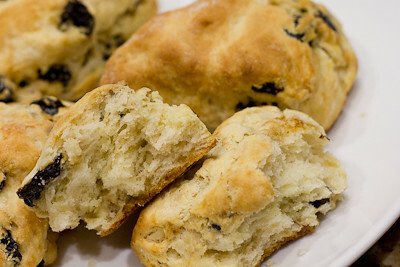 I almost didn't make this one because I just got back from a long trip, but scones are quick and easy so I went ahead and threw this recipe together. After returning home, my fridge was pretty bare, and I did not have any heavy cream on hand. I decided to substitute whole milk for the cream. Instead of currants, I added dried cherries to my scones. I'm not sure if it was just me, but I made the scones, cut them, and put them on the baking sheet... and then looked over and saw my dried cherries still sitting on the counter! I freaked out, because they weren't in there and if I added them now, I knew I would risk over working the dough. Worried that the scones would be too plain, though, I went ahead and put all the dough back into my mixing bowl, added the dried cherries, and gently mixed them in with the spatula. I was convinced that they wouldn't turn out because of how much mixing I had to do to get the cherries evenly incorporated into the dough, but to my surprise, they still came out perfect! Thanks Lynne, for hosting this week. The scones were delicious. They were nice and flaky, and perfect without any butter or jam. If you would like the recipe, you can find it here. 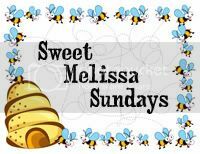 Make sure you check out the TWD Blogroll, to see how everyone else enjoyed this breakfast treat! Also - big congrats to Aaron Richards and Heather (comments #10 and #15) - you're the winners of my recent Tropi Treats Giveaway! You have 48 hours to contact me with your mailing address; after that, I'll choose an alternate winner. - My scones were done about 3-4 minutes early, so be sure to check them frequently. - A tip for making good scones (or biscuits) is to grate your butter ahead of time and then stick it in the freezer for a few minutes to chill before adding it to the flour. Alternatively, you can simply grate frozen butter into your flour. Great job making these after a trip! I've done the same with recipes before-seeing what I left out on the counter, but usually my dish is already in the oven before I see the mistake. I didn't see where you add the currants, either! Thanks for baking with me. I love scones! I'll have to try these - I've never used cherries in my scones. I think you're right, I don't remember seeing the instruction to add the currants either. I kept re-reading to look for the instruction... Good to know these worked well with milk instead of cream, they look wonderful! I just looked, too, and I don't see it. I usually toss the mix-ins with the dry ingredients before I add the wet stuff, and that usually works well. Your scones look great! I've alway been intimidated by scones. I'm not sure why exactly but I'm pretty sure I can (and will) screw them up. These look delicious and maybe I'll get over my fear and make an attempt. Maybe.